Judy Coates Perez: Triple Inspiration! Last month Jane La Fazio taught a lesson to her monthly art quilt class using teabags, similar to the work I have done collaging them on fabric. One of her students, Susie Zolghardri, had also been reading Carla Sonheim’s book and did some cat drawings, using a pillow as the support below the drawings to get more playful shapes, as Carla suggests in her book. 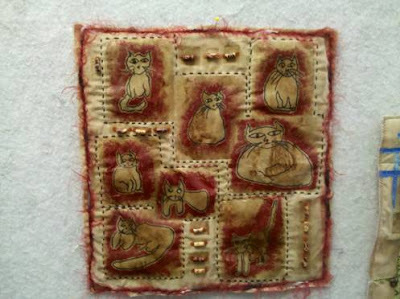 Susie traced her cat drawings to teabags and made this adorable quilt! It's so fun seeing inspiration from three different sources all coming together to make something new. I had to go back to find out more about tea bags. I have used them to stain fabric, but never used the bags. I really like the look though. thanks for the mention Judy!! I'll forward this to Susie, she'll be thrilled. 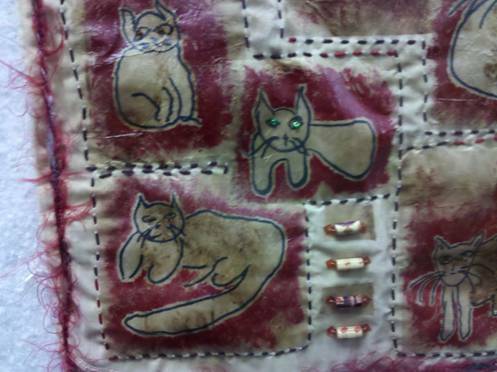 Thank you so much for mentioning my art quilt on your blog. It was so fun to make, the tea bags are very easy to work with. Jane was right, I'm thrilled!